I made this quick little gift card using the Sweethearts cartridge to cut the sentiment, "For You." The embossed pink background is made using Cuttlebug's Heart Block embossing folder. The hearts are cut with a Fiskars punch. I added some purple crinkle ribbon and purple gems. The papers are specific colors that match with the next project I'm going to share with you. But first, let me tell you that our sponsor for this challenge is our very own Design Team Diva, Barb from BugBites. She is providing one of her fabulous stamp sets as the prize! 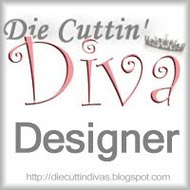 We hope you'll join us for the challenge this week at Die Cuttin' Divas. You'll have one week to enter your card, layout, or altered project. Please remember to include which die cut you used and provide a link back to our site. Now I want to share the rest of the project matching the gift card. My niece is a bridesmaid in a friend's upcoming wedding this spring. The bridal shower was held this past weekend, and she was responsible for making the shower favors. Well, we made this four layer paper cake together! I mostly did the cutting with my Cricut and she did the folding and assembling. She's very ambitious! Didn't it turn out great? The cake was made using the cake box cut from p. 67 of the Tie the Knot cartridge. The words and other images were cut from both Tie the Knot and Sweethearts cartridges. Each layer has 9 boxes and we graduated the layers by cutting 4 different size boxes. The top layer box was 5.25", second layer 6", third layer 6.75", and the bottom layer 7.5". That's 36 boxes in total, which my niece filled with candies and mints. She said it was a big hit at the shower. I'd like to link up this project to the following challenges. LOVE your beautiful card Pat and that cake is awesome!!! Gorgeous colors!! You card is very PRETTY!The cake is absolutely GORGEOUS!! Pat, this is stunning. What a lot of work. Your card is so beautiful!! Pat, that paper cake is awesome!! Love it. Hi Pat I love how this came out I actually saw it on another challenge and then in reading it found out you enter the DL.ART I may have to lift this idea I have seen it similar , but the colors you used are great. When I originally bought this cart. I bought it specifically for that cut. and I have never used that cut. Fun how trn out-- You did an awesome job. Thanks for joining us at PDE "Anything" challenge. Your niece is a true friend to the bride, this is a labor of love. That cake favor box wedding cake (say THAT three times fast) is beautiful! What a great idea. It could be used for all sorts of occasions and so clever. Obviously you both went out beyond the usual (thinking outside the cake box eh?) and had fun with it. That's perfect for our Opus Gluei theme! I'm so happy you came over and shared this project with us! Please come back for more challenges at Opus Gluei! WOW! the cake is amazing and so pretty! !Your card is lovely too. I hope you are doing great. Have a fantastic day! Oh WOW, an amazing project!! All the details in the smaller parts are great and the whole cake looks good enough to eat. ;) Thanks for joining us at Tuesday Throwdown! Popping by to wish you a Happy Easter! Your paper cake is amazing! How fun and such a great idea! LOVE! Gorgeous creations hun and thank you for popping by mine and leaving such a sweet comment...means a lot!! So pretty. Thanks for joining us at Shelly's Images.